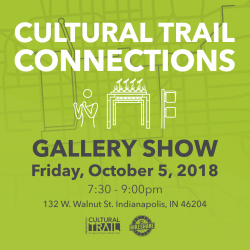 We’re excited to announce we’re hosting our Second Annual Cultural Trail Connections Gallery Show in conjunction with First Fridays this Friday, October 5, 2018, 7:00 – 9:30 p.m. at Cultural Trail Headquarters, 132 W. Walnut Street. The second annual Cultural Trail Connections will highlight 12 pieces of art inspired by the Cultural Trail’s permanent public art collection. The gallery show is free and open to the public. Patrons will be able to bid or buy the art in the gallery show. All proceeds benefit the maintenance fund for Cultural Trail’s Permanent Public Art Collection which includes Dancing Ann by Julian Opie, Prairie Modules 1 & 2 by M12, Care/Don’t Care by Indianapolis based artist Jamie Paulus and Moving Forward, by Indianapolis based artist Donna Sink. More information about the Cultural Trail’s permanent collection is available at indyculturaltrail.org/alongthetrail/art. Cultural Trail Connections is a family friendly event with several activities for people of all ages. A cash bar offers Sun King Beer, wine, and Cultural Trail Mix from Best Chocolate in Town. All of the art is framed and ready to take home, compliments of The Great Frame Up in downtown Indianapolis. Bidding starts at $60 and a “Buy It Now!” option for those who want to take advantage of it.